QUESTION: When is a good time to score a goal? ANSWER: Anytime. QUESTION: When is the best time to score your 100th goal? ANSWER: Anytime. 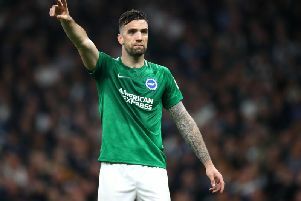 This week on Albion Unlimited we posed the question as Glenn Murray needs just one more to reach a century for Brighton and Hove Albion. Would he love to score it at the Amex? When do you want to score it? “As soon as possible” came the swift answer from former Seagulls striker Warren Aspinall. He was right. Of course it would be nice to score at the Amex with a huge home crowd but ultimately you want to get there as quickly as possible. You never know how long you may have to wait! Murray didn’t have to wait long for his first goal for Albion – or two for that matter – as he was on target twice in a 3-0 win over Crewe. It was actually his first start as he made his debut as a substitute against Northampton. The goals continued to flow in that first spell but right across any striker’s career there are times when the goals dry up. There is also the threat of an injury. A few weeks ago former West Ham forward Dean Ashton joined us as he is now a pundit after his playing career was cut short by injury. Murray loves playing against the Hammers and yet another goal against the London club was inevitable last time out. Now though Albion face another away trip to Newcastle and the Seagulls have struggled for goals and wins away from home in the Premier League. The result is ultimately the most important thing but as Warren also pointed out, it would seem in some way appropriate as friends and family may be in attendance. It all started for Murray not far away in another northern enclave Carlisle as the Cumbrians went on to win the Conference in 2005. I’m not sure you win anything for 100 goals but it is certainly impressive to make it to three figures for just one club. Here is another question. How many could he get? 110? 125? Well, despite turning 35 last month he is in the form of his life. It is arguably more difficult in the Premier League but Murray doesn’t seem to be phased by anything at the moment. I think he won’t mind when, where or how it comes: This Saturday or next weekend: At the Amex or at St James’ Park: Header or off the shin. He won’t care. In the end they all count. Albion supporters will be hoping it counts on Saturday as they bid for a first away win since November last year. They will all certainly have plenty of time to celebrate on the long journey home from Tyneside.